A city state with 5.6m people, Singapore has one of the fastest ageing populations in the world. The number of those aged over 65 is expected to reach 900,000 by 2030, and a rising number are living to 100. Notwithstanding a variety of well-intentioned government support strategies, the elderly in Singapore are often working as manual laborers in low-paid unskilled jobs, like clearing trays at food courts, to meet rising costs. The picture of fragile seniors vending packs of tissues or gathering scraps of cardboard to sell to recyclers has become an increasingly everyday sight in the prosperous island nation. While some choose to continue working to stay physically energetic and mentally active, rising elderly poverty rates and the growing number of seniors who are staying in the workforce indicates that more are working out of need than choice. And many retirees continue to look for jobs even after retirement. “Singapore may boast of the highest percentage of millionaires in the world, but retiring in this wealthy financial hub is becoming even more difficult for the common man. According to a study by HSBC, the citizens of this country, which has one of the highest per capita incomes in the world, face the grim prospect of running out of their savings almost halfway through retirement as the high cost of living and increased life expectancy eats into their nest egg,” one CNBC writer said. The employment rate for permanent residents and Singaporeans 65 and over reached 27% in 2018 from about 16% ten years ago. In addition to government schemes and employers looking to retain workers, many older people look for jobs after retirement because Singapore is among the world’s most expensive country and many residents complain that the government’s retirement savings scheme does not provide enough money. Presently, over 650 companies in Singapore have taken advantage of the S$300,000 ($221,174) job redesign grant beginning 2016. Other schemes include wage offsets to employers of older workers and a grant to adopt progressive age management practices. “The economy requires the participation of older workers because of demographic changes. There are fewer young workers today compared to the past,” says economist Randolph Tan of the Singapore University of Social Sciences. Studies show that tapping on the older workforce has huge benefits for the economy. To this end, Singapore is a big proponent of helping seniors continue to work beyond the official retirement age. In 2012, a law required that companies offer re-employment to their staff up to the age of 65 and in 2017, the re-employment age was extended to 67. Apart from legislation, the Government has also rolled out grants to help companies make their workplace more age-friendly. The Age Management Grant, under the WorkPro scheme, allots funding of to $20,000 per company to help employers implement age-friendly practices. 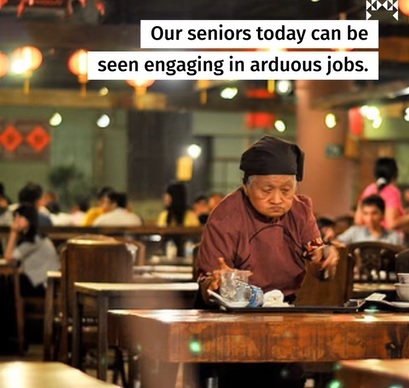 At its core, the Singaporean government recognizes that to guarantee sustained economic growth, it needs to keep older workers in the labor force longer and is presently taking steps to boost the employability of older workers.